For the bicentennial of its first publication, Mary Shelley’s original 1818 text, introduced by National Book Critics Circle award-winner Charlotte Gordon. Nominated as one of America’s best-loved novels by PBS’s The Great American Read. 2018 marks the bicentennial of Mary Shelley’s seminal novel. For the first time, Penguin Classics will publish the original 1818 text, which preserves the hard-hitting and politically-charged aspects of Shelley’s original writing, as well as her unflinching wit and strong female voice. 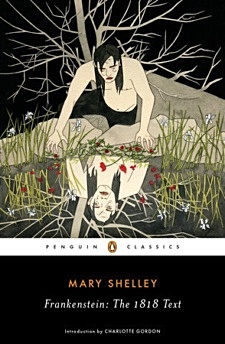 This edition also emphasizes Shelley’s relationship with her mother—trailblazing feminist Mary Wollstonecraft, who penned A Vindication of the Rights of Woman—and demonstrates her commitment to carrying forward her mother’s ideals, placing her in the context of a feminist legacy rather than the sole female in the company of male poets, including Percy Shelley and Lord Byron. Mary Shelley: The daughter of Mary Wollestonecraft, the ardent feminist and author of A Vindication on the Right of Women, and William Godwin, the radical-anarchist philosopher and author of Lives of the Necromancers, Mary Goodwin was born into a freethinking, revolutionary household in London on August 30,1797. Educated mainly by her intellectual surroundings, she had little formal schooling and at 16 eloped with the young poet Percy Bysshe Shelley; they eventually married in 1816. Mary Shelley’s life had many tragic elements. Her mother died giving birth to Mary; her half-sister committed suicide; Harriet Shelley (Percy’s wife) drowned herself and her unborn child after he ran off with Mary. William Godwin disowned Mary and Shelley after their elopement, but—heavily in debt—recanted and came to them for money; Mary’s first child died soon after its birth; and in 1822 Percy Shelley drowned in the Gulf of La Spezia—when Mary was not quite 25. Mary Shelley recalled that her husband was “forever inciting” her to “obtain literary reputation.” But she did not begin to write seriously until the summer of 1816, when she and Shelley were in Switzerland, neighbor to Lord Byron. One night following a contest to compose ghost stories, Mary conceived her masterpiece, Frankenstein. After Shelley’s death she continued to write Valperga (1823), The Last Man (1826), Ladore (1835), and Faulkner (1837), in addition to editing her husband’s works. In 1838 she began to work on his biography, but owing to poor health she completed only a fragment. Although she received marriage proposals from Trelawney, John Howard Payne, and perhaps Washington Irving, Mary Shelley never remarried. “I want to be Mary Shelley on my tombstone,” she is reported to have said. She died on February 1, 1851, survived by her son, Percy Florence.